I'm talking to you class of 2020!!!!!!! As a rising senior (I don't like to talk about that, I'm in a bit of a depression) I feel like I've learned a thing or two about packing for college. I already have most everything packed up in bins so now I just have to conquer packing my clothes. But I realize packing is no easy task. Especially when you're going into your freshman year and really have no clue what to expect. 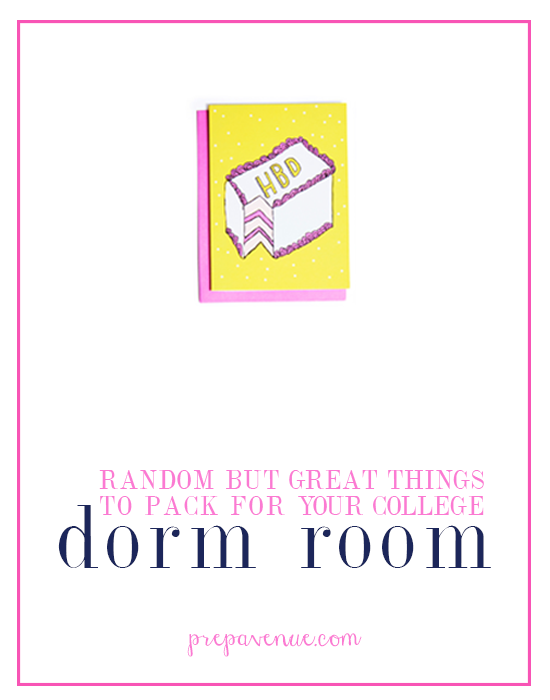 You can follow college packing lists (like this one I wrote!) but really there are always little random, but great things to have in your dorm room that are often left off of those lists. Setting up a dorm room is kind of like setting up a mini household. Suddenly you have to think about everything you might possibly need in the next 8 months and find a place for it in a teeny tiny little space. These are the items that people often forget, but I have found really helpful to have in your dorm room at college! Birthday Cards // I promise you will make so many new friends! And with all those new friends you are going to make you're going to need birthday cards, and sometimes at the last minute. It's nice to keep some cute birthday cards in your room to have them when you might forget about someone's birthday. Thank You Notes // Such a simple southern gesture and appreciated much more than you will ever know. It's nice to write them for the simplest of things and having them at hand will encourage you to use them more often! Slippers // You're not always going to be dressed to the nines and put together perfectly. Slippers are perfect for hanging out in leggings and t-shirts and wandering around the dorm. I used mine more than I ever thought I would. 4. Costume Pieces // College isn't all fun, but it is a lot of fun. And you might find yourself going to a few college parties! A lot of parties are themed so it's good to have a few fun costume pieces on hand so you're ready for a few different themes (like American, neon items, etc). Also great for other themed events like bid day! 5. Hot Glue Gun // Now I'm not a huge crafter, but I have used my glue gun multiple times every year. Between fun posters and different projects, everyone on my hall knew I was the girl with the glue gun. 6. Mini Tool Kit // Another item I didn't ever imagine I would need. I didn't event bring one to school! Luckily my good friend Kjersti (who I lived with last year and will live with again this year!) did bring one and I have borrowed it so many times. It's so helpful to have one and so thankful that Kjersti has one that I can borrow! 7. Birthday Decorations // I wrote a whole post about how to make a birthday special in college, and my friends are definitely experts at this (a video my friends made of my 20th birthday!). Keeping decorations in your room is such an easy way to make someone's birthday so special. Highly highly recommend having a few things on hand! 8. Throw Blanket // Movie nights? Hanging out in another girls room? You don't want to take your entire bedding off your bed! As someone who always gets cold, I loved having a little throw blanket that I can use all the time.